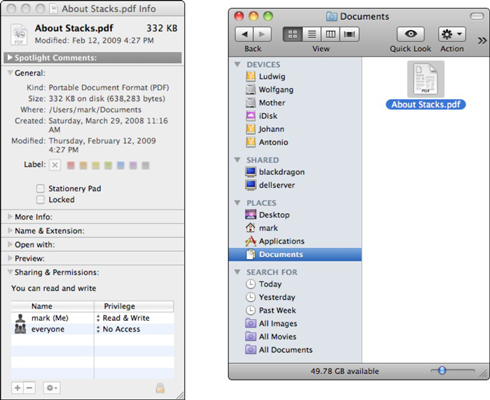 Mac OS X Snow Leopard lets you set permissions on files you own that determine who can access those files. The combination of privileges, ownership, and group determines who can do what with the file. Four possible actions are allowed through permissions: Read-only, Read & Write, Write Only (Drop box), and No Access. When you (or the person with the administrator account on your Mac) created your user account, you were automatically granted ownership of your Home folder and everything that it contains as well as any files or folders that you store in the Shared folder or another user’s Public folder. Click the item to select it, press Command+I (or choose Finder→File and then choose the Get Info menu item). If you have a mouse or trackball with a right button, you can right-click the item and choose Get Info instead. Either way, Mac OS X displays the Info dialog. Click the right-facing arrow next to the Sharing & Permissions heading. The Sharing & Permissions settings expand. The Info dialog offers Sharing & Permissions settings. To change your own permissions on the item, click the You Can pop-up menu and choose a new Ownership permissions level. This is likely set to Read & Write, and it’s a good idea to leave it alone. If you’re the file’s owner, you’re likely not a security risk. Never choose an access level for yourself other than Read & Write without being absolutely sure of what you’re doing, because you can potentially prevent yourself from accessing or deleting the file in the future! If you simply want to lock an item to prevent changes being made, select the Locked check box in the General section of the Info dialog. You can easily clear the Locked check box later to make changes to the item. To change permissions for someone else or a group, click the Privilege value for that user or group and then choose the appropriate value from the pop-up list. If necessary, set the permission for the Others pop-up menu. If a user isn’t the owner of an item and doesn’t fit into any group that you’ve selected, this access permission setting for this file applies to that user. If you’re setting permissions for a folder, Snow Leopard can automatically change the permissions for all the items contained in the folder to the same settings. Click the Apply Enclosed button, and Mac OS X displays a confirmation dialog. Generally, it’s a good idea not to override the permissions for all the items in a folder, so click the Apply Enclosed button only when necessary. After all the permissions are correct, click the Close button. This saves your changes and returns you to your friendly Finder. If a specific user or group doesn’t appear already in the Privilege list, click the Add button (bearing the plus sign) and you can add a specific privilege level for that user or group. You can also delete a privilege level: Click the desired entry to select it and click the Delete button (which bears a minus sign).